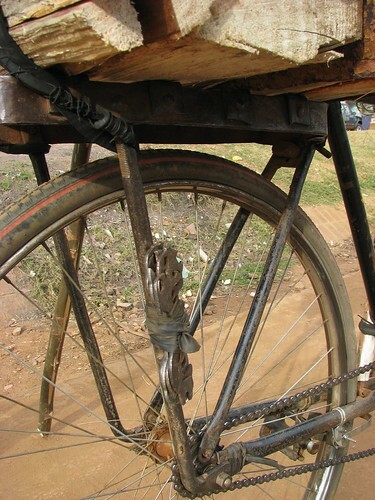 In Malawi, like in many other developing countries, the bicycle is king for transportation and cargo carrying. The bikes we saw were primarily chinese or indian manufactured. They looked like the old 3speeds once widely available in the states. On the back of nearly every one was a sturdy steel rack, many of the racks were customized for load carrying. In 4 weeks in Malawi, I only saw one bike without a rack. He was probably riding it to the shop to have a rack put on it. Regular people used bike taxis to get around. The passenger would sit on a padded cushion on the rack. They were probably all one speeders. Gears or changing hubs would probably break, and become costly or difficult to repair. Even the western style mountain bikes that I saw had the derailleur bypassed or removed and the chain shortened. This set is a sample of many more. To see the full list of bike photos, click on the onbike tag on the left of any photo in the set.